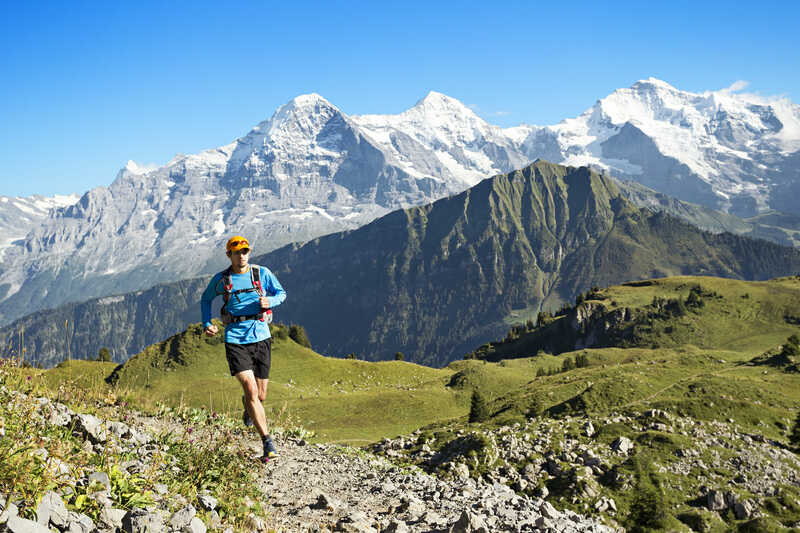 In honor of David Letterman’s recent announcement that he’ll retire sometime in 2015, we here at Run the Alps have pulled together a Top 10 list of our very own—the Top 10 Reasons We Love Trail Running in the Alps. We’ll share the full list over the coming weeks. Ready for the first two? Here we go! The combination of graded trails and Alp verticality means that an hour of steady running can find you far above the chalet in the village where you started. The view can be startling. There’ll come a moment when you look down, see the village clock tower, and think to yourself, “I ran that? Just now? Whoa!” It’s a sense of accomplishment that comes from running in the mountains, where the views are plentiful. The result can be, I think, quite powerful. After a few weeks of running in the Alps, the idea of what’s possible shifts, and barriers collapse, even for the most casual of runners. It’s not an exaggeration to say you may never look at a mountain the same way. It’s time for lunch! Oh, good… there’s a hut. Mid-trail run, in the Valais Alps near the border with France. If there’s a way to move a person through, over and around the mountains, well, the Swiss have it. When I was a boy, hiking in Switzerland with my parents, I was fascinated by each new contrivance and quickly learned the difference between a funicular, cog railway, a télépherique, and, well… you name it. It’s a cliché, but it’s absolutely true: The Swiss have perfected the art of mountain transportation. As a trail runner, Switzerland’s mountain infrastructure opens the door to endless possibilities. Want to run to an alpine col, and down to the next village for lunch? No problem. You can hop on the local cog railway and be back where you started in 20 minutes. There is one form of mountain transport best skipped, though: Switzerland’s Rega air ambulance. If you need them, however, the good news is that Rega is absolutely the best in the world at what they do—and they’ve done it all, from evacuating wandering cows to saving injured climbers on the side of an Alp north face. I once joined a friend on a Rega ride to the Lucerne hospital, and it’s not an overstatement to say that James Bond himself would have been envious. Rega’s new ad campaign, by the way, is fabulous. It features the icon Swiss St. Bernard, as the announcer says, “Until he can fly, there’s Rega.” Here’s an English version of the latest ad. Every now and then, it happens. You’re running along, through the Alps, and you pass by a beautiful, old farm. No one’s around. The farmer might be off delivering milk to the cooperative, in the valley below. But… what’s this? There’s yogurt and cheese in a fridge, and a jar atop with Swiss francs in it. You’ve just found the DIY Swiss farm stand! Stop, put a few francs in the jar, grab a slice of some of the best cheese you’ll ever taste, and find a few cows or sheep to thank for making it. They’re probably right around the corner. The service here is terrible! The cows are always off in the pastures. For most of us, trail running is usually a simple affair. You pick a trailhead, run as long as you like, and one way or another, you end up back at your car. Not so in the Alps, however—and nowhere is that truer than in Switzerland. Run for a few hours, and now you find yourself in another village? No problem. Hop on the train back. Interested in checking out a high hut, but prefer to pass on the steep climb portion of the effort? The next tram, or chairlift, or funicular, is probably leaving in 10 minutes. Want to run to Italy or France, have lunch and come back? It’s been done! Done running near the high Alp town of Bettmeralp to the summit of Sparhorn, in the UNESCO Bernese Oberland World Heritage Area. The return trip included: chairlift, tram, Post Bus, train… and a final tram back up to the village. Nice going, Switzerland! Last we counted, there were over 70 trail races in Switzerland. (You can check them all out, right here.) Among that list, a very high percentage of them get some of the best mountain runners in the world. Unless you work in Salomon’s design center in Annecy, France, nowhere are you more likely to literally bump into more elite trail runners, than during the summer in the Alps. A number of world-class trail runners have made the Swiss Alps their home, and almost all of them spend at least part of the summer there, participating in Skyrunning events and other races. And when they’re not racing, they’re out and about– and you might just cross paths. Literally. 1. The Swiss can build a trail wherever the heck they want. 3. No one back home will ever believe you. Would you believe it, if someone told you a trail went directly up this cliff? I didn’t think so. But… look closely! Oh, and if you don’t care for heights? No worries. The Swiss have thought of that, too. There are safety chains right where you’d like them, every time. Enjoy the view, without too much of a heart-pounding adrenaline rush. Whenever we look through our photos of trail running in the Alps, we’re always amazed by the number of photos of meals! Simple hut lunches… locally-crafted chocolate… fresh yogurt in a glass jar… and larger affairs at the end of a long day. Food figures so prominently because, simply, it’s so very good! Much of it is local, and all of it is carefully created. The Swiss appreciate great ingredients, and it shows. There aren’t many places in the world where a simple piece of cheese and bread can be so delicious! Lunch! This time, at Cabane d’Anthème. There’s so much left to mention, how would we possibly pick one thing we loved most about trail running in the Alps? So, our top slot in this little list goes to everything else we didn’t get a chance to mention: Switzerland’s absurdly easy SBB CFF FFS federal rail system. The friendly, four-legged farm animals who line your route as you run—sometimes even creating a bit of a mountain traffic jam. Stopping at an aid station at a trail race… and finding a 70-kilo wheel of Gruyere. Looking up and seeing one of the world’s most famous peaks for the first time. Hopping on a one-car local cog railway train after a long run, to get back to your village. And, to inspire you up that final hill to the ridge, after a long hour climb… the farmer who steps outside the barn and claps while you run past. It sure helps with that last uphill push to the hut and the big view just a few minutes away. Somebody doesn’t want to share the trail! En route to Belalp, in the Valais region. That’s our Top 10 list. Of course, it’s ever changing, based on the most recent Alp run. What’s on your list? Let us know!